Tags, similar to hashtags on social websites, allow you to categorize nearly any item in your Chalk & Wire account so that you can easily locate it later on. 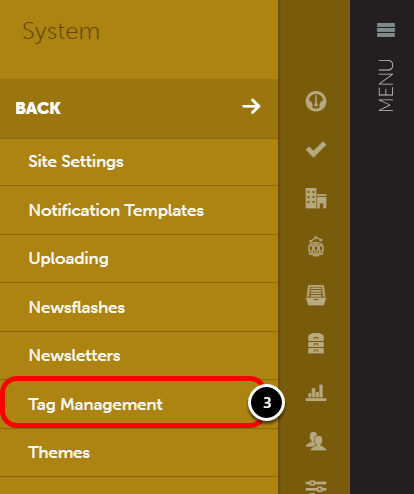 The Tag Management feature enables you to create new tags, manage existing tags, and manage whom may use this feature. 2. Select the System menu. No Tagging: Assessors will not be able to access tagging. Assessors See All Submissions and Assessment Tags: Assessors are able to see and use tags that have been entered or used by anyone in your Chalk & Wire site. Assessors See Only Tags Added by Assessors: Assessors are able to see and use tags that have been entered or used by other Assessors. 5. Select whether or not Students may see and use Tagging. 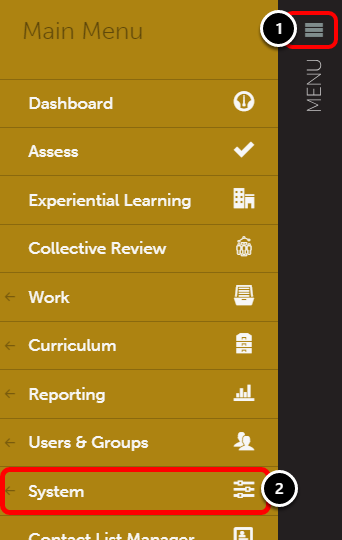 6. Review and manage Existing Tags. Each tag will have the option to Rename and Delete. Tags may be deleted even if they are in use. 6. Bulk Import new tags into your Chalk & Wire site. You may use the bulk importer to import one or more tags at a time. 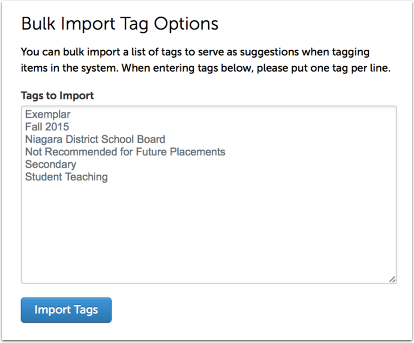 Importing tags is especially useful if Assessors will be using this feature. This will ensure that appropriate tags are being selected in your Chalk & Wire site, rather than new/incorrect tags being entered and requiring management later.